At the parallel 2017 I gave a talk about "GPU computing with CUDA in OpenCL" (in german). This talk contains all the necessary background knowledge needed for a succesful start into GPU computing. At the parallel 2015 i gave a talk about multi GPU computing titled "Multi-GPU-Computing: Eins, zwei, drei, ganz viele". In the talk "Tipps & Tricks für den erfolgreichen Einsatz von GPU-Computing" (tips and tricks for the successful use of GPU computing) i gave an introduction into the optimization of GPU kernels. Tam Hanna wrote in his blog "Die mobile Denkfabrik" "Jörn Dinkla bot derweil ein interessantes Kontrastprogramm ..." ("Jörn Dinkla provided an interesting contrast"). I published two articles in the magazine "iX Developer Programmieren heute 1/2013"
I gave a talk about my experiences with GPU computing with CUDA and OpenCL, titled "GPU-Computing mit CUDA und OpenCL in der Praxis" ( GPU computing with CUDA and OpenCL in practice). 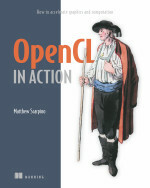 I was technical proofer of the book "OpenCL in Action" for Manning Publications Co.. The author Matthew Scarpino says in the acknowledgements "Jörn Dinkla is, simply put, the best technical editor I’ve ever worked with". I wrote the Groovy EMF builder and the Groovy UML2 builder. These tools use the builder concept of the programming language Groovy to ease the processing of Eclipse Modelling Framework and UML2 code. Ed Merks, the project lead of the Eclipse Modelling Frameworks (EMF) wrote "This sounds too cool. I wish I had time to explore. I wonder if this might make an interesting EMFT component?" 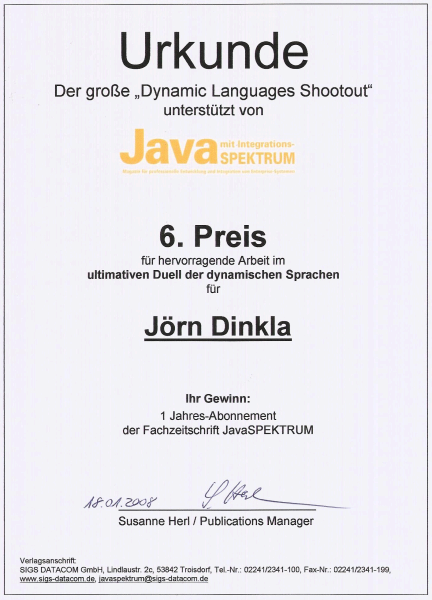 The german magazine JavaSpektrum organized the programming contest " Dynamic Languages Shootout" for the OOP 2008 conference . The challenge was to create a game similiar to Scrabble(R) in a dynamically typed programming language. I used Groovy and Grails and came 6th. See further information. I participated at Eclipse BugDays in july, august, september, october and november 2007 an helped debugging the eclipse projects JDT, PDE/UI and ECF. In november 2001 my web pages on fraud detection with artificial intelligence were the site of the month (Le site du mois) of the former web-datamining.net. These pages are gone and are only available at the internet archive. My web pages on fraud are referenced in the books Investigative Data Mining for Security and Criminal Detection by Jesus Mena and Computer and Intrusion Forensics by George Mohay et. al.